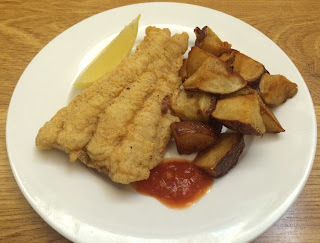 After catching a few eater catfish on a recent fishing trip we decided to fry a few fillets up. Common cuisine across the south in both restaurants and at home is cornmeal dredged fried catfish and that's what we had planned. Catfish are a fairly easy fish to clean and when done correctly the innards are never pierced or exposed, simply feel down the rib cage and where it ends is where the cut for the tail fillets begins. Cut down to near the spine and follow to the tail, then repeat on the other side. You can then cut down along the back bone and over the ribs to pull off two more boneless slabs. When skinning take time and try and leave one or two millimeters of the flesh attached to the skin as you go along. (This is the bloodline or less desired darker meat). Soak the skinned fillets in salted water for 45 minutes or so to pull out any blood, leading to nice clean white flesh. You can then trim the meat of any darker bloodline and any yellow tinged flesh (less desirable meat) from the back slabs and get to dredging and frying or store in ziplock bags over night to fry the next day. Dip the fillets in an egg wash or buttermilk and then dredge in the combined mixture listed below, once coated put fillets on a drying rack for five minutes before frying at 375 degrees for 6 - 10 minutes depending on size. Serve with a hot sauce or tarter sauce of your choice and a lemon wedge. A Paddle Down the River.